Today was a marvelous day of adventure, prayer, friendship, and learning the Bible. We did not want to kill our poor pilgrims who are still a bit weary from jet lag and travel so we took in three important Rosary sites and walked in the footprints of Jesus on top of the Mount of Transfiguration, Cana and Nazareth. Remember that Jesus lived to be thirty-three years old and of those he lived quietly in Nazareth for thirty of those years. We talked about the Annunciation and how the angel met the 15 year old Mary that probably had muddy feet at the time of meeting. We also discussed the typical day in the life of the Holy Family. The couples all renewed their wedding vows. One couple celebrated their 50th anniversary in Cana today. Well I could say more, but you can see it all for yourself and I hope it helps the Bible come alive for you like it is for all of us. How do you summarize a day like today with people falling into bed and others staying up to talk about their adventures? It was a rich day filled with spiritual adventure, great meals, lots of fun and a deep sense of being close to the Lord. We started out in Bethlehem where we shopped at a Christian store and our purchases helped 60 Christian families where there is 70% unemployment. This is the only time we go shopping because that is not what the pilgrims came to do. The olive wood products, mother of pearl, Russian icons, antiquities and more were very enticing. We also heard the OUR FATHER prayer in the language of Jesus. 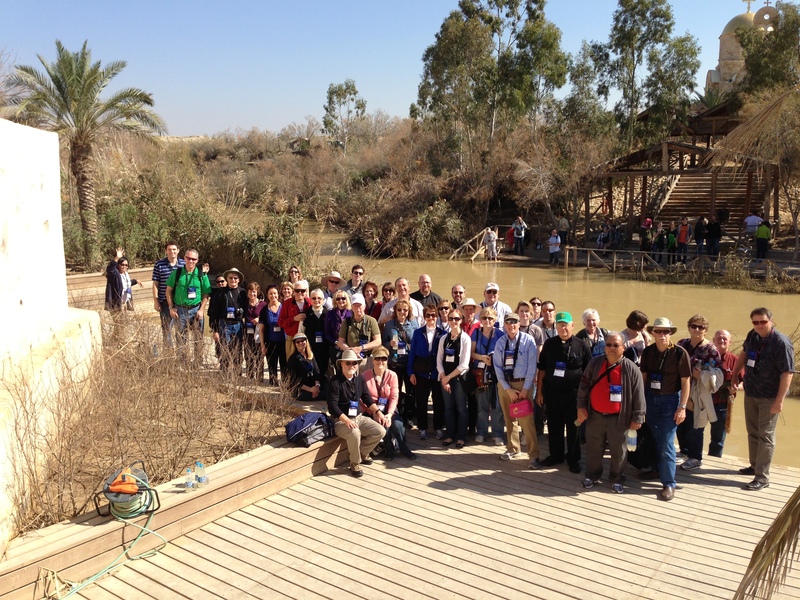 After I took everyone down to the factory to watch the Christians making the olive wood items, we loaded on the bus and headed to the amazing place where Mary gave birth to Jesus. We were blessed with no line and were able to go straightaway into the grotto. There were many tears of joy as people knelt down and kissed the place where Jesus was born and where Mary introduced him to the world. This is one of the holiest places on the face of the earth!! Lunch at the Christmas Tree Restaurant — again to help a Christian family. Schwarma and falafels were delicious. The priests learned how to cook falafels. Visiting a Carmelite Monastery with the relics of the Palestinian Arab girl’s relics and wearing her cape in prayer was very moving. Blessed Miriam of Jesus Crucified was beatified by Pope John Paul II. Then to Shepherds Field for Mass in the cave where the shepherds were guarding their flocks by night when the heavens opened and the angel of the Lord announced the birth of Jesus to the shepherds. Wow! We ate the Passover Lamb with Palestinian rice before dancing the night away. Wait until you see the fun the pilgrims had dancing in the gentle yet pulsing manner of the locals. Of all the days on our pilgrimages, today tends to be the most fun. 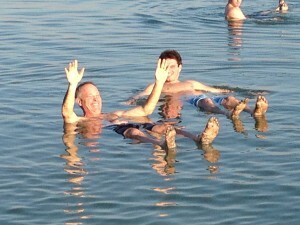 Camel rides, floating in the Dead Sea, visiting the Jordan River where Jesus was actually baptized and loads of fun and laughter along the way. Praying 7 Mysteries of the Rosary on Location in 1 Day! Mount of Olives — Jesus walked here, prayed here, taught his disciples to pray here and he sweat blood here. We had Mass at Gethsemane where the sins of the world fell on the holy, holy, holy Son of God. The real pain of the passion happened here. One Mystery here. Caves have great significance here. The disciples learned the Our Father in a cave. Jesus also ascended to heaven from the same place. One Mystery here too. The Palm Sunday Road. We walked it and imagined Jesus with us overlooking Jerusalem with tears in his eyes. 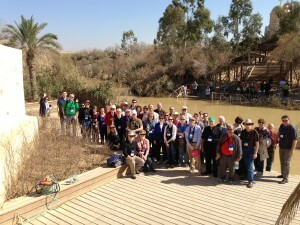 Lunch at a Jewish kibbutz, not as exciting as walking in the footprints of Our Lord. Mount Zion required four Mysteries of us. Two at the Church of Mary’s dormition and two in the Upper Room. Here the birthday of the Church took place, three sacraments were instituted and the Holy Spirit fell on the disciples in the Upper Room. We heard a rooster crow (well, kind of) as we visited the place Peter denied his Lord and where Jesus was lowered into a cistern prison over Holy Thursday night. We read Psalm 88 in the dungeon. Then, Steve (me) gave a 25 minute overview of Salvation History from Adam and Eve until today. We did it with the whole panorama laid out before our eyes. The only view of Jerusalem that could be better would be from a helicopter. Then to the Visitation where we saw Mary and the Ark of the New Covenant, Mother of the Church and the Mother of God. After that, free time for group discussion before dinner and a free evening. Wow!